“Hey mom!” said the kid, “Next time you go to Trader Joe’s, buy some edamame hummus.” After trying the stuff at a friend’s house, he was hooked. He’s apparently not the only one crazy for cross-culturally-tweaked versions of the classic Middle Eastern dip now available in umpteen flavors all across America. And though I was overdue for a trip to Trader Joe’s, I thought: “Wait a minute! You’ve got three bags of frozen soybeans in the downstairs freezer. Why not make some yourself? Sure, it’s easier to rip open a ready-made container, but the homemade version tastes so much better. So, the next time I hit my local supermarket I bought a can of tahini (aka sesame paste, look for it near the peanut butter or in the “ethnic food” aisle). You can find shelled soybeans at our many Asian supermarkets (I bought the ones in the photo at Shoreline Central Market, where 16-ounce bags are often on sale for $1.39 — enough to make several heaping cups of hummus). Before making my first batch, I searched online and found this Food Network recipe. The lemon zest called for was a nice touch, but it didn’t have enough lemon juice in it for my taste, so I added more — along with some cayenne for heat. The thing about making someone else’s recipe your own is that except for a few must-have ingredients (in this case edamame, tahini, olive oil, lemon) the rest is up to you. Hate the flavor of garlic or cumin? Don’t use it. Too much lemon? Not enough? Add. Subtract. Like it thick? Don’t add water, as many recipes suggest. Can’t find soybeans? Heck, use garbanzo beans. They’ve been doing it for eons in the Middle East. And that, my friends, is the true joy of cooking. That and owning a Cuisinart Mini-Prep Plus, a handy device for small-batch hummus-making among other simple tasks. Costco usually stocks them for a bargain-priced $25. I’ve had mine for two years, and since buying it, I rarely pull out my honking, heavy, standard-size Cuisinart that’s served me well since I got it as a gift in 1982. P.S. I recently saw a new 4-cup version of the Mini-Prep, and I’ve been lusting after it big-time. Don’t have a food processor? Fear not: you’ve got other options. My initial batch of homemade hummus didn’t last long, so two days later I made more, a process that took about five minutes — 10 if you include the clean-up. Only this time I didn’t use a recipe. Instead, I grabbed my Mini-Prep, tossed in a cup of edamame (“boiled” briefly with water to cover in the microwave, then drained), a 1/4-cup of tahini, the juice of a whole lemon, a big garlic clove, a 1/4-teaspoon ground cumin, 1/4 teaspoon of cayenne, 1/2 teaspoon of kosher salt. Then I pulsed till it was smooth-ish, added some good olive oil (about 2 tablespoons) and blended it some more. On Sunday, I griddle-grilled Greek-style pita, cleaned and sliced a bunch of fresh radishes and served the dip to the friends who turned us on to the TJ’s version. 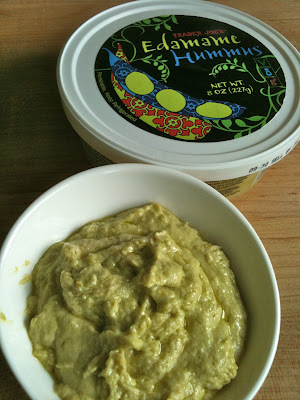 The hummus is always greener — at Trader Joe’s. Fans of hummus in its many-splendored guises, feel free to speak up. What’s your brand-of-choice, or better yet, your favorite recipe?